The “Office 365 Updates” bulletin proved extremely popular in 2016, keeping our clients up to date with new features and functionality in Office 365. As a result, we are splitting the monthly bulletin into an Administrator version, covering technical aspects of running Office 365, and an End User version, which will give users information on things that are changing on Apps such as OneDrive, SharePoint and Mail. If you would like your end users to receive these updates, either ask them to register using the form below or contact us to supply a list of your users. The new style Office 365 Admin Centre is now the default view for all users. 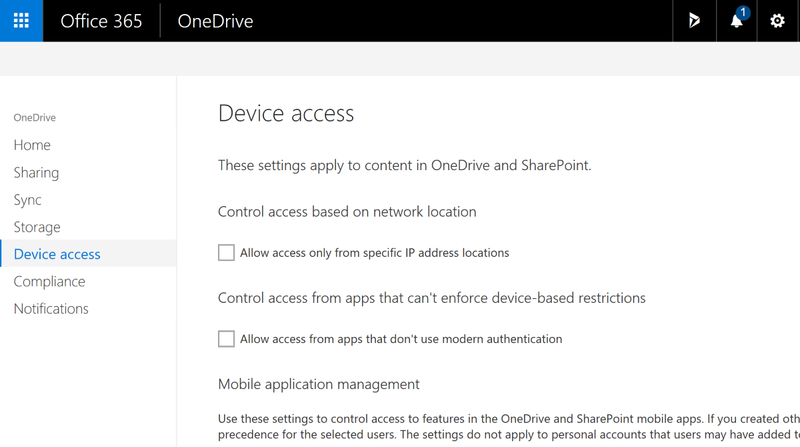 During December, a new OneDrive for Business admin centre was released allowing easy control of sharing, sync and mobile access. Microsoft Teams and GigJam (Sharing App) had new Admin Sections added, and further additions were made to the Service Health Dashboard. This is a new dashboard that is currently in preview, making it easier to view outages, incidents and advisories. It will be rolled out to all admins during February 2017. A reminder that Office 2013 will not be available for download from the Office 365 Portal from 1st March 2017, and support will no longer be available. If you still have users on Office 2013, you are advised to upgrade them to Office 2016 before that date. You will shortly be able to specify approved network ranges for access to SharePoint Online and OneDrive for Business. Once this is configured, all access to these systems will be blocked from unknown locations. Microsoft have updated their list of subcontractors who have access to Office 365 data. The rules that are in place for data access are stringent. Full details of the measures that are in place to protect your data can be found here. The user experience for sharing from OneDrive for Business when working in the browser is being simplified, rolling out during February. It allows users to choose their method of sharing – emailing or copying a link to the clipboard – more easily. Office 365 automatically stores a history of your files’ changes while you are working on them, whether it is in SharePoint, OneDrive or OneDrive for Business. New functionality has been added to make it easier to view changes and restore previous versions. Click here for more information. 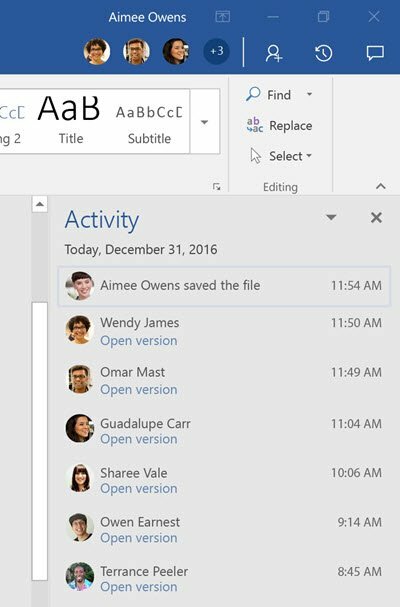 Outlook Groups are a great way for users to quickly set up a collaboration space for a team, with a calendar, tasks, notebook, files and conversations. A feature has been added so that all members of a Group will receive a calendar event in their inbox when a new event is added to the calendar. This will make it easier for members to keep track of things happening in their projects. So for example, if you want all expense reports sent to a Billing department alias rather than bombarding a specific person, you could set up a Billing group. Billing@yourcompany.com can be set up as a group to receive all your organisation’s billing inquiries. Individuals who work in the billing department and are a part of this group can respond back as the Billing department identity. 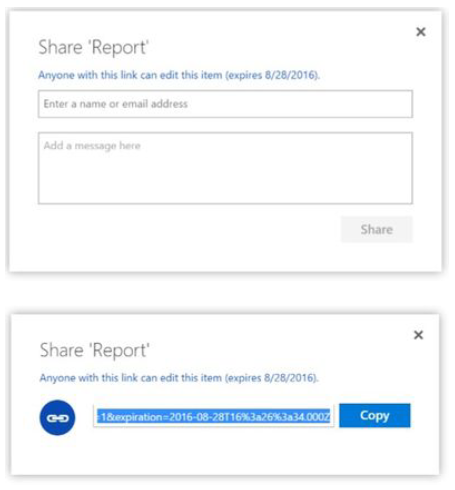 You are now able to download multiple items from OneDrive for Business or SharePoint. Files will be downloaded in a zip file. 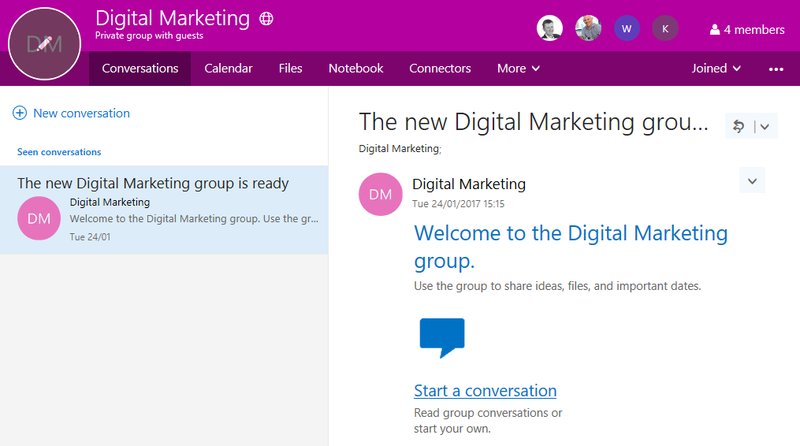 Office 365 Groups are being improved by creating a SharePoint Online Team Site for every group. This brings a new home page, news, notebook and recently active content. Groups have also been given a new menu bar, bringing together all of the features that were available into an easy to navigate site. Private Groups (Unlisted) – only the admin of the Group can grant approvals to new members. This change more closely aligns the permissions to other Office 365 concepts. The Office 365 Admin Centre has a growing number of reports to let you see how Office 365 is being used in your organisation. A new report is currently being released to show which devices people are using to interact with Yammer. Focused Inbox is a refinement of the popular Clutter feature in Outlook. Rather than moving emails into the seperate Clutter folder, Outlook will give two tabs – “Focused” and “Other”. Users will be able to quickly switch between these tabs. As an administrator, you can control the roll-out of this feature. You also have tools to ensure that business critical emails always land in peoples’ Focused tab. Users will be given an in-app prompt asking them whether they want to opt in to Focused Inbox, or stick with Clutter. previous post: SharePoint or OneDrive?